We will depart from our private building at the Fullerton Municipal Airport (Near Disneyland) and fly you and your party to Napa County Airport (KAPC) with up to 6 passengers in style. Upon arrival at our Fullerton Terminal, you will be served a bottle of chilled Veuve Clicquot Champagne or VOSS water as you take your seats on board our 1957 Beech Super 18 airliner. Once airborne, we will take you on a tour of downtown LA, the Hollywood sign and the Hollywood Hills as we head toward Malibu then past Santa Barbara. We will then pick up the coastline and fly at a low but comfortable altitude of 2,500' so that the coastal views can be enjoyed out both sides of the aircraft through our huge "picture windows" that are reminiscent of riding a high-speed train through France. We will point out the sights along the way as you will be in constant communication with your pilots through our custom Bose noise cancelling headsets. We will fly along Highway 1 to the Golden Gate Bridge where we will make our turn into the San Francisco Bay and descend into Napa County. This is the most luxurious and beautiful way to see California on our way to the only wine capital in the United States. This is truly amagical and epic flight that most people have not experienced since the 1960s. If you would like to buy a 60 minute flight with us, please purchase this package. Up to 6 passengers can ride with us on our flying adventure from Fullerton Airport. If you would like to fly longer than 60 minutes, let us know and we can add more flight, if you desire, and you can pay the difference after the flight. 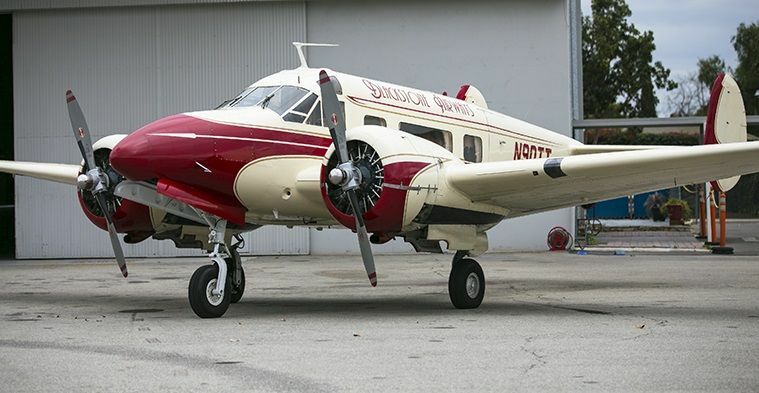 We are confident that once you fly in our 1957 Beech Super 18 Airliner, you will not want to fly any other way. SkyThrills, the brainchild of Michael 'Rocket' Blackstone, began flight operations in 1999 with their the world-class aerobatic Pitts S-2C. It spawned from Michael's passion for flying extreme aerobatics that began while flying with his father in his Pitts S-2A from when he was just 8 years old. 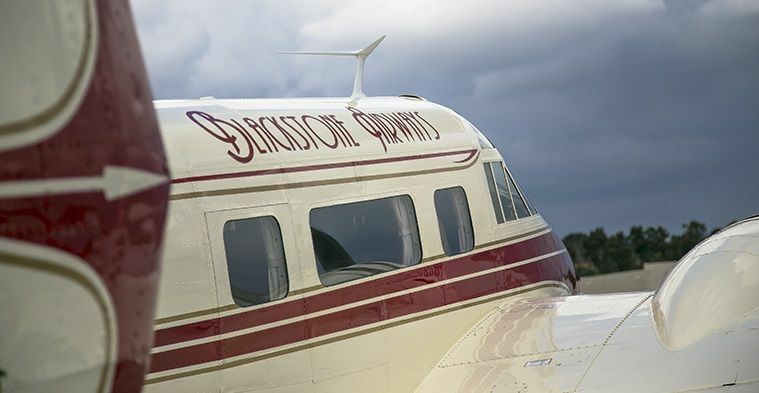 Copyright (c) 2000 - 2017, BLACKSTONE AIRWAYS; All rights reserved.